Chang San-Feng (Traditional Chinese: 張三丰; Zhang Sanfeng) is shrouded in legend as an immortal mythical hero and a monk-warrior-martial artist endowed with magical powers. Various traditions differ on his birthdate, birthplace, and death date. One tradition holds that he was born at midnight on April 9, 1247 near Dragon-Tiger Mountain, or Mount Longhu (Traditional Chinese: 龙虎山; Lónghŭ Shān), in Kiang-Hsi Province in southeastern China. He purportedly lived for over 200-300 years during the Han Chinese Southern Song (1127-1279) and Mongol Yuan dynasties (1271-1368) up to the middle of the Han Chinese Ming dynasty (1368-1644). Though his family's ancestors had lived on Dragon-Tiger Mountain, his grandfather took the family to the city of Yi Hsien (易賢) in Liao-Lin, a northeastern province. His father, Chang Chun-Jen (常春仁), passed the examinations for a high rank position in the government of Yuan Emperor Tàizōng (太宗), or Ögedei Khan (Mongolian: ᠥᠭᠡᠳᠡᠢ; Ögüdei; Traditional Chinese: 窩闊台), but his father turned down the position preferring to live in the mountains. His first name was Tong (通) and his courtesy name (given upon adulthood) was Junbao (君寶). In ancient China, a person's appearance was believed to mirror the person's intelligence and character. He was said to be born a wise man since he featured the arched back of a tortoise and the build of a crane. His large round eyes were indicative of intelligence and long life. As a youth, he was renowned as a Confucian and Taoist scholar and writer. His scholarly names were Chuan Yee (川義) and Chun Shee (春茜). During the rule of Yuan Emperor Shìzǔ (世祖), or Kublai Khan (Mongolian: Хубилай; Hubilai; Traditional Chinese: 忽必烈), he was nominated to serve as the Magistrate of Boling County (博陵縣) near present-day Dingzhou, Baoding, Hebei. Upon the passing of his parents, though, he resigned his position, gave away his property to his clan, and set out on a journey in search of enlightenment that lasted thirty years. While traversing the mountain regions near present-day Baoji, Shaanxi in midwestern China, he saw the peaks of three mountains and took the Taoist name "Sanfengzi" (三丰子), which gave rise to a variety of other names, including Chang San-Feng. Some stories say Chang San-Feng spent ten years living in the Pao-Gi Mountains near Three Peaks (San Feng), where he mastered the Shaolin Five Animals style (Traditional Chinese: 五形; pinyin: wǔ xíng; literal: "Five Forms"). A branch of the Five Animal martial arts is the Northern Shaolin style of Yue Chia or Yuejiaquan (岳家拳, Yue Family Fist, alternately Yue Ch'uan). Other accounts say that Chang San-Feng stayed in the Shaolin Temple in Henan province in northeast China, where he likely studied under and interacted with the famed Shaolin Abbot Xueting Fuyu (雪庭福裕). He became renowned as a master of the Shaolin "external" martial arts before leaving the Shaolin Temple. He then spent several years on the holy summit of Yellow Mountain, or Mount Hua (Traditional Chinese: 華山; Huà shān). He was said to have lived around the villages in the area, spending much time observing nature in the local forests. He would often materialize when help was needed in a village; work in the fields, help bring in livestock, assist a local to build a home, etc. When the task was completed, he would leave without a word. In this manner, he became revered among the local people. In 1314, when he was aged 67, Chang San-Feng met the Taoist mystic Huo Lung (火龍; Fire Dragon) from whom he learned about immortality. After about ten years of living on Mount Hua, he wandered towards the Wudang Mountains (Traditional Chinese: 武當山; Wǔdāng Shān), where he practiced Huo Lung's methods. He lived scores of additional years, continuing his benevolent activities, while serving as a priest, healer, diviner, and sage. He taught meditation, alchemy, medicine, and qigong (Traditional Chinese: 氣功; qìgōng; "Life Energy Cultivation"). He survived difficult political times across his many years by pretending to be mad, gaining the nickname "the sloppy Taoist". Legends make Chang San-Feng into a Xiān (Traditional Chinese: 仙 仚 僊; Hsien). A Xiān (literal: "Fairy") is a Taoist term for an enlightened person, an immortal, an alchemist or wizard, a spirit, a person with superpowers, or a transcendent being. A Xiān (仙) is similar to a Rishi who is an inspired sage in the Indian Vedas (ancient Hindu scriptures). Emperors of the Ming Dynasty, who were working to build up their armies, heard of his reputation as a martial artist. In 1391, the first Ming emperor Hongwu (洪武) sent a team to find him, but it failed. The third Ming emperor Yongle (永樂帝) dispatched more search teams from 1407 to 1419, but these were unsuccessful as well. Chang San-Feng is credited for creating neijia (內家), or internal martial arts, specifically T'ai chi ch'üan, or Taijiquan, "Grand Ultimate Fist," (Traditional Chinese: 太極拳; tàijíquán), a Neo-Confucian fusion of Shaolin martial arts with Taoist internal energy cultivation daoyin (or neigong) techniques. Chang San-Feng is said to have observed five animals—the tiger, the dragon, the snake, the crane, and the leopard—and to have determined that the snake and the crane, through their movements, were the ones most able to defeat strong, relentless opponents. The movements of the snake and crane as they effortlessly shifted from moving in slow, calculating manners to fast, explosive attacks held his attention. The snake's calmness and its posture when prepared to strike especially impressed him. After witnessing the incident, Chang San-Feng created an internal style he called Mien Chuen, "Cotton Fist," (Traditional Chinese: 棉拳; Mián quán) that would develop into modern day T'ai chi ch'üan. It consisted of a set of 72 movements that imitated the movements of the crane and snake, emphasizing flexibility and suppleness over strength. Chang San-Feng practiced his new style in seclusion, going to the woods where he is credited with creating the "Thirteen Postures" of T'ai chi ch'üan. One day, his new skills were tested when a gang of bandits set upon him. He used elusive movements to avoid their attacks and tire them. Once exhausted, he struck down his would-be victimizers. Thereafter, Chang San-Feng began teaching his style to Taoist monks at a nearby Wudang Temple, giving them lessons on slow and fast forms daily at dawn and dusk. This knowledge was passed down to future monks, many of whom in following generations claimed that he appeared while they were practicing to evaluate the development of his style. A number of legends assert that he lived for two hundred years thanks to breathing exercises, his practice of internal healing, and his knowledge of alchemy. When viewed apart from his legend, Chang San-Feng was a real person. His birthday is celebrated on the ninth day of the third month in the traditional Chinese Kan-chih lunisolar calendar. He traveled widely, and like many long distance walkers in those times, was skilled in martial arts (specifically the White Crane and Snake Shaolin styles) for protection (likely in the use of the staff and the double-edged jian sword in addition to empty hands). He learned from different Confucian, Taoist, and Buddhist Zen teachers in accordance with the Three Teachings (Traditional Chinese: 三教; Sān jiào) tradition. He spent periods of time at the Shaolin Temple and at Taoist centers on Mount Hua and Mount Wudang. He was reclusive and disdained conventional Chinese social proprieties. He was a highly respected master of internal energy arts, a defensive and "internal" style of martial arts, mysticism, philosophy, and alchemy. His breadth of knowledge, high moral character, writings, and high level of skills drew many followers who maintained his mind-body practices, studied his writings, and told and retold stories that became more fanciful over the following 900 years. Furthermore, traditions exist about an earlier Taoist priest and sage Master Chang San-Feng, who was born during the Han Chinese Northern Song dynasty (960-1127). 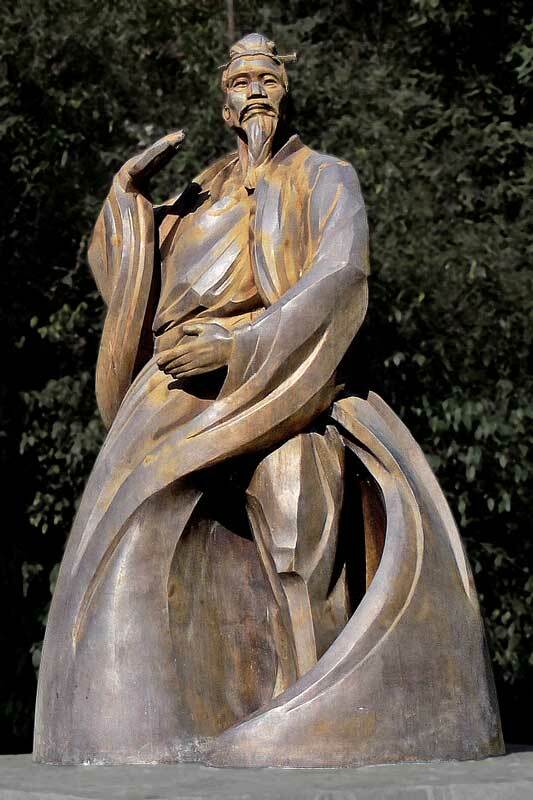 He also lived in the Wudang Mountains as an ascetic hermit and created a style of internal martial arts that became popular among Taoists living and studying on Mount Wudang. 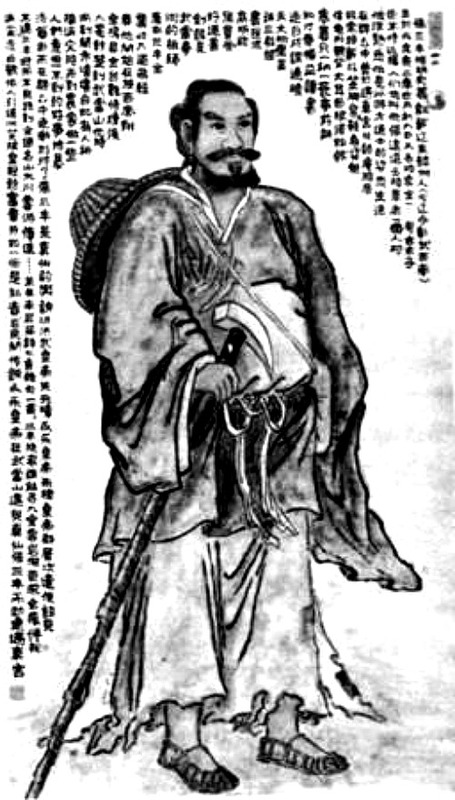 His master was possibly Xu Xuanping (許宣平), a Han Chinese Tang dynasty (618–907) Taoist poet and expert of daoyin (導引; "guide and pull"), a precursor of qìgong. Documents from the archives of Yang and Wu-style taijiquan families say Xu Xuanping was the teacher of the later Chang San-Feng, but it is more probable that he was associated with the earlier Chang San-Feng. For millennia, inhabitants in India, Tibet, and China have used gentle stretching exercises, breathing methods, herbal remedies, and martial arts training methods to improve health, cure disease, restore vitality, and prolong their lives. Master Chang San-Feng, like Bodhidharma, is a reference point for the imagination immersed in the history of Buddhism and Taoism and centuries of martial arts and health exercises. These traditions are maintained in Detroit and Madison Heights classes offered by the Michigan Shaolin Wugong Temple.